Normal well-co-ordinated gut peristalsis requires both muscle and nerve function. When there is damage to the muscles or nerves or both, dysmotility occurs. 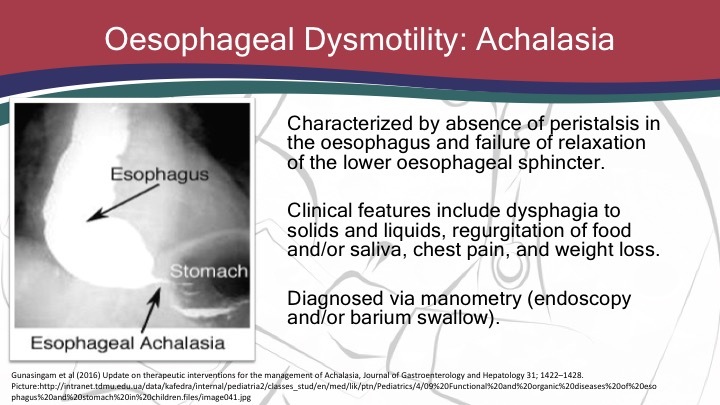 This dysmotility gives rise to GI symptoms which are commonly abdominal pain, nausea and vomiting. These are symptoms which we would regularly see in many of our clients. 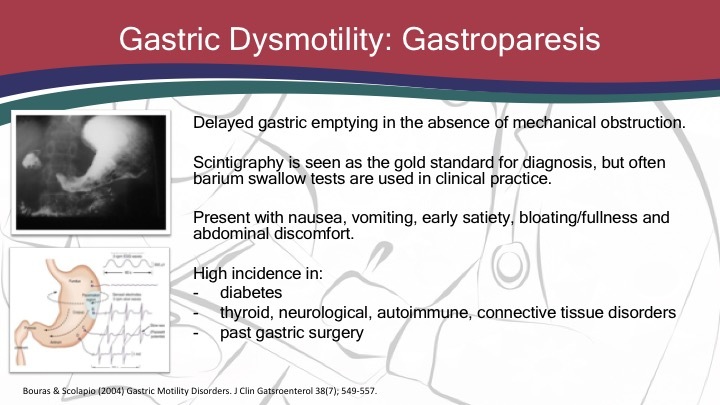 Sadly, from the onset of symptoms, it takes an average of eight years for someone to be diagnosed with a dysmotility disorder. The symptoms may be initially mild, then progress and after a while expand to include an eating disorder, anxiety and depression. With awareness we can help reduce this time until diagnosis. She explained the nutritional management using a stepwise approach starting with oral then enteral and in extreme circumstances parenteral feeding. Sharon reminded us if we are struggling with a client with a dysmotility pick up the phone or email a gastro dietitian from a major centre for advice. Sharon Carey is the head of dietetics at the Royal Prince Alfred Hospital in Sydney. Recently she has been seconded in a managerial role to the cardiothoracic surgical unit at the hospital to assist them regain their surgical accreditation. Sharon has been working as a gastrointestinal specialist dietitian for over 10 years and has a specific interest in major gastrointestinal surgery including intestinal failure. Her PhD involved looking at the long term nutritional consequences of major upper gastrointestinal surgeries, and the impact on quality of life. She has been awarded a Churchill scholarship and recently (2019) been awarded an NHMRC fellowship grant.